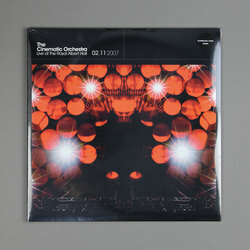 The Cinematic Orchestra - Live at The Royal Albert Hall. Vinyl LP, CD. Bleep. The Cinematic Orchestra featuring a 24 piece Heritage Orchestra and vocal contributions from Heidi Vogel, Lou Rhodes (formerly of Lamb) and Grey Reverend, performing live at The Royal Albert Hall on November 2nd 2007.